It’s so unlike me to wait years to go to a raved-about, local burger joint. But somehow, I had never made it to Hodad’s. So when I realized that I was graduating, and leaving San Diego, it became clear that such a travesty be righted. So I called Katie and said, “we are going to Hodad’s.” She had no qualms about this plan. The original Hodad’s is in Ocean Beach, but we didn’t feel like waiting for a table, so we went to the 2011-new downtown location. It was an early dinner, so we had no trouble parking. Our order was promptly taken, and food was served quick. The restaurant itself is a fun environment. I think the OB location is dive bar-ish, but this one is more of a restaurant-style burger joint. I always love the out-of-state license plates on the wall – sure to keep me distracted from my NEED FOR CHEESEBURGER NOW!!!! Pet Peeve #1: Frozen, store-bought onion rings. 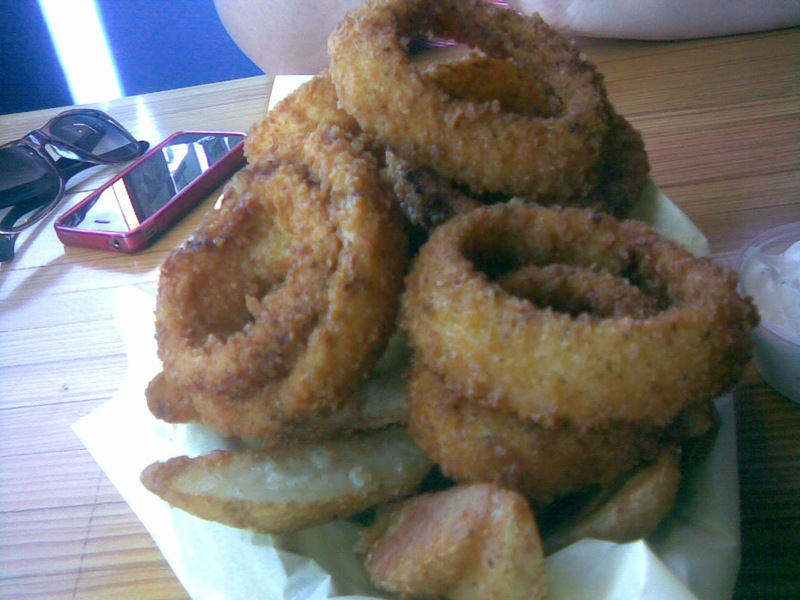 Nothing is like a hand-breaded fresh onion ring. The rings here were clearly homemade, and clearly delicious. The fries were thick wedge-cut, and full of potatoey goodness. Pet Peeve #2: Milkshakes that cost $5-$6, barely have any milkshake in the refill tin, and are lacking in the ice cream department. This shake was almost entirely ice cream – just how I like it. Although my go-to shake is a vanilla-malt, I was willing to switch it up with a chocolate-malt shake on this occasion. It had good flavor, but I think I just prefer vanilla to chocolate. As for the burger, it was served pretty quickly after the frings and milkshake. 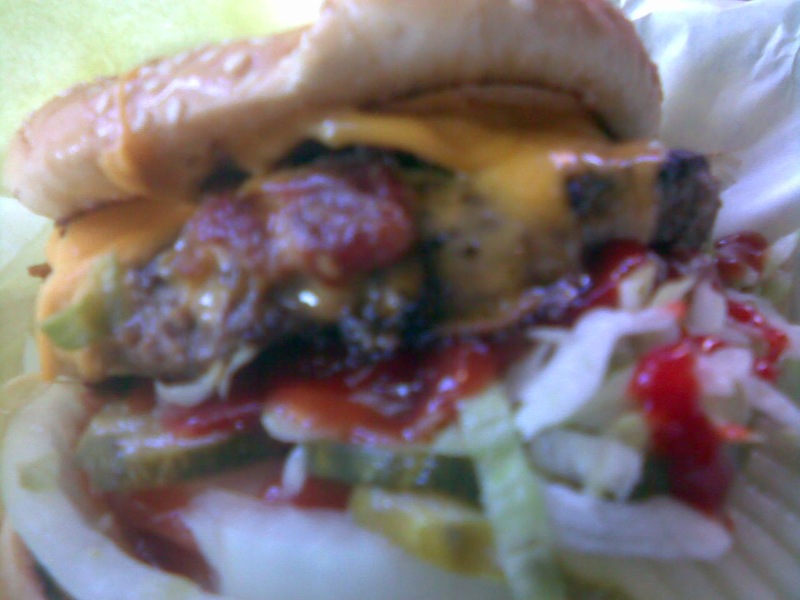 I had really high-hopes for this juicy bacon-cheeseburger. Well, the burger itself was delicious & full of flavor. What a great cheeseburger. I could eat here over and over again if I had continued to live in SD. To clarify, though, I had a piece of the bacon separately, and it was simply delicious. This discovery leads me to believe that the cook was a bit too heavy-handed with the condiments. I think the burger was about $7.00, and the frings and shake were about $4.50 each, all of which seemed more than reasonable. I thoroughly enjoyed my experience here, and while my arteries are thanking me for waiting this long to go to Hodad’s, I regret I did not go sooner. When I next visit SD, this will be my first stop.